Video game movies are funny business. Most of them are horrible, and yet the cultural consciousness they share is so huge that they can't help making more. The problem, obviously, is that video games revel in giving the player a sense of being a character, thereby reducing the main video game characters thin enough to project on. That is a problem when you try and make a literal translation - like the newest Prince Of Persia film that tries hard enough and yet falls short. It's a tad tedious and quite silly - even though the overall intent is to create a Pirates Of The Caribbean style CGI-filled joyful adventure. It's loud, as most Hollywood summer films tend to be, and no expense has been spared in the effects, and the art design has been managed to a T. Still, the soul of the film - the 2 leads asked to carry it through - has no chemistry whatsoever. Jake Gyllenhaal, affecting an utterly atrocious English accent (being as the film is set in Persia - the Queen's English comes as a surprise) that is also inconsistent from scene to scene (was he trying for Cockney, or a more Northern accent, or a Southern one? 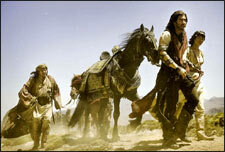 Who knows - he's as muddled as we are), plays Prince Dastan, an orphan raised by the King as his own. Very quickly, things happen, and suddenly the Persian army attacks another country under the pretext of Weapons Of Mass Destruction (no kidding). Dastan ends up being framed for killing the King, and in possession of a dagger that can turn back time. He must work with rival princess Tamina (Gemma Arterton) to protect the dagger and to bring the evil Nizam (called Nizam) to justice. There is a banter-filled romance here, which not only is annoying, but also completely unbelievable. The lines are trite and Arterton's performance is screechy. Gyllenhaal suffers in that department too - he's fine, I suppose, and he does have a lot of presence, but tasked with staring at a green screen most of the times, he often has a befuddled expression that makes him come across as more confused bumbling hero than a roguish charmer, which he seems to be going for. The supporting cast fares patchily too. Alfred Molina, as a merchant enamoured with dodging taxes, is a complete hoot, while Sir Ben Kingsley as Nizam the Nizam (can't get old, this) is as comically villainous as can get. He isn't threatening so much as this cackling old dude who has some ninjas to spare. That being said, the fight sequences with said ninjas are good, and offer better combat sequences than the newest PoP videogame. The excessive CGI with world-changing events is a bit overwhelming, but the hand-to-hand combat is good, and the parkour that Gyllenhaal's stunt double gets to are a sight to behold. Too bad the dagger spoils everything. In the game, when the dagger lets you turn back time, it's a fun gameplay device. In the movie, it's a world beater. As soon as someone dies, or some tension occurs, you expect them to activate the dagger and have a do-over. There is tension or emotional investment in any of the action sequence because our heroes cannot lose. They can try and try again like the proverbial spider. A lot happens in Prince Of Persia: The Sands Of Time. Most of it is shrouded in the excessive CGI or the poor script, but there are moments of soaring beauty in the scenes. Mike Newell is a very visual director, and it is clear what he was brought on to do - he just does it so much that a lot of it becomes unwatchable. Still, this is a new high in video game films. It is not completely bad, and bits of it are engaging. It is worth half the price of your admission ticket, which is more than can be said of films based on video games. It's a dry week for new films - and you could do worse. Be the first to comment on Prince Of Persia (Hindi)! Just use the simple form below. fullhyd.com has 700,000+ monthly visits. Tell Hyderabad what you feel about Prince Of Persia (Hindi)!